Meet Maní. 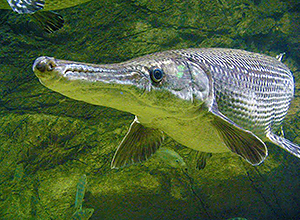 He’s a Cuban Gar (Atractosteus tristoechus) or manjuarí (pronounced man-whah-ree) – a fish endemic to Cuba. Manjuarí are a skeletal species going back millions of years. They evolved with a vascularized swim bladder allowing them to breathe atmospheric air to a certain extent. Their ancestors were among the first vertebrates on the planet, and a possible link between fish and land animals. This huge member of the Gar family is found in the rivers and lakes of western Cuba and Isla de la Juventud. Its cylindrical and elongated body is similar to a reptile and has tough pointy scales. Its head is flat like a crocodile, and its skull is extremely hard. The manjuarí is dark green and grows up to two meters (6.5 feet). Its mouth is powerful and armed with three rows of small sharp teeth. The manjuarí is an endemic Cuban fish of prehistoric origin. 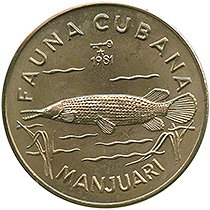 Cuban commemorative coin celebrating the rare manjuarí. amphibians, crustaceans and birds) or escaping such enemies as crocodiles and spear fishers. The only other fish manjuarí get along with are those that cannot fit into their mouths. Manjuarí prefer warm fresh water lakes and rivers, but sometimes reside in brackish swamps. Its young often fall prey to the introduced largemouth bass (Micropterus salmoides). The manjuarí is endangered in most of its habitats. Fortunately captive breeding efforts are underway in Cuba. People do eat manjuarí flesh, but not its poisonous eggs. Cordially Yours Travel is an authorized sponsor of Cuba travel in accordance with the US Department of the Treasury, Office of Foreign Assets Control (OFAC) section 31 C.F.R. § 515.572(a)(1).